The Odisha state government has evacuated more than 300,000 people from coastal districts. Cyclone Titli, which intensified into a "very severe cyclonic storm" over the Bay of Bengal, made landfall on India's eastern coast early Thursday, the Press Trust of India (PTI) news agency reported. Several teams of the Odisha Disaster Response Force (ODRF) were deployed in nine districts - Ganjam, Puri, Jagatsinghpur, Khordha, Cuttack, Balasore, Mayurbhanj, Boudh and Kalahandi, according to the Home Ministry. Talking to mediapersons after the meeting, Chief Secretary Aditya Prasad Padhi said the process of evacuation of people in the low-lying areas of the five aforesaid districts has begun with 753 persons in Ganjam districts have been shifted to the multi-purpose calamity shelters. "Keeping in mind heavy to very heavy rainfall forecast, we have chose to declare holidays for schools and educational institutions in four districts from tomorrow", said Padhi. Fishermen have been advised by the Met department not to venture into the sea along and off West Bengal coast, Odisha coast, deep sea areas of North Bay and Central Bay of Bengal till October 12. The Odisha unit of Congress on Wednesday opened a 24-hour emergency cell to help the people likely to be affected by the cyclone "Titli", which is fast approaching towards the coastal areas of the state. Trees were uprooted and road connectivity was hit, as winds up to 140 kmph ravaged the coastal districts. Stressing on the government's "zero casualty" disaster management policy, Patnaik said, "The state government has been closely monitoring the situation". 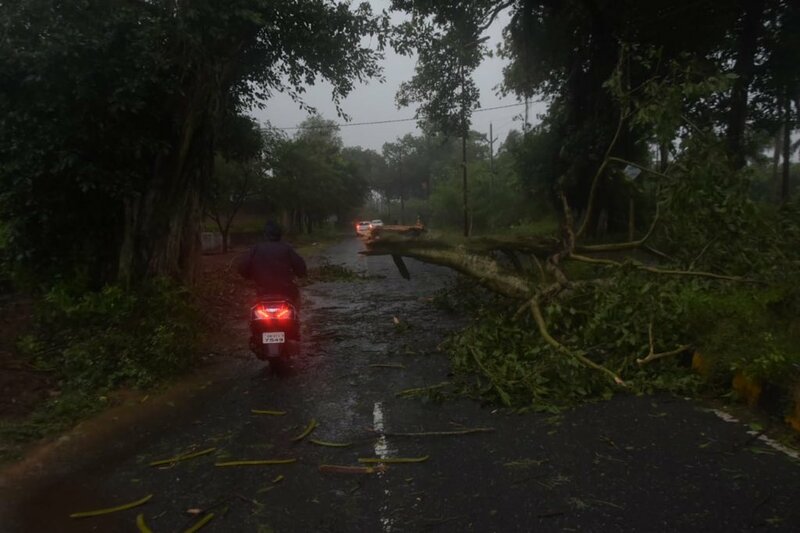 Road communication between Berhampur-Kanamunda in Ganjam district disrupted as trees have been uprooted at many places under the influence of CycloneTitli; ODRAF team on the spot.